At Axiom we always strive to solve our customers’ problems by delivering exactly what they require and naturally it helps immensely if they already know what it is that they need. When we were approached by Stuart Rivett, managing director of B2C Europe, he did know precisely what he wanted, but unfortunately he couldn’t find it. He had been searching for an automated solution for some time without success; his company had expanded using a manual sortation system to the point that he was rapidly running out of available floor space. To compound the problem his busiest period, Christmas, was just around the corner. When Rivett read about a sorter we’d made for a business called Healthspan, he knew that he’d found a company that could provide the answer to his dilemma. Negotiations swiftly followed and we designed, manufactured and installed a bespoke 100 destination packet mail sorter at B2C Europe in Aylesbury. The sorter is, in Rivett’s words, “An excellent product, robust, reliable and completely fit for purpose. It does exactly what it says on the tin!” Running at three different speeds, it can process 3,000, 5,000 or 8,000 items per hour. The multiple sizes of packages being sorted vary tremendously in both volume and weight – some as light as 100 grams, others as heavy as 5 kilograms. 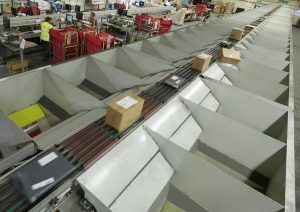 All of the packages travel up an incline conveyor into the sorter, passing under a scanning gantry which directs them to one of the 100 destination chutes. 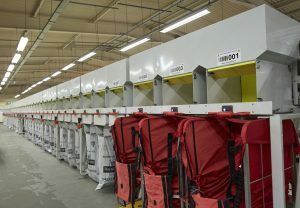 Each chute can accommodate either Royal Mail bags or Yorks, depending on the size of package being sorted. Changing from a manual to an automated sortation system has transformed the way that B2C Europe operates at its Aylesbury facility, increasing both productivity and efficiency. The high throughput of the Axiom sorter has also given the company the futureproof ability to handle three times its current volume within the same footprint.